Virginia Del. 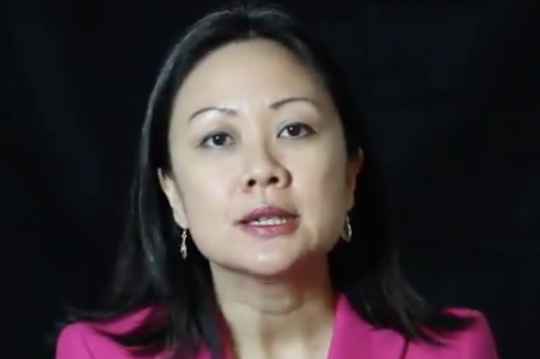 Kathy Tran (D.) posted a video Thursday morning defending her bill loosening regulations on third-trimester abortions, but now she's saying she misspoke when she talked about the bill. Tran drew attention from pro-life figures and some news outlets for her comments about HB2491, a bill that would make critical changes to abortion restrictions in the state—comments she now disavows. Back on Tuesday she defended the bill in the Virginia Assembly saying abortions should be legal on the day the baby would be delivered, even when the mother is dilating, if her physical or mental health would be "impaired" by giving birth. But Thursday she told the Washington Post she had misspoken, mere hours after she took to Twitter to hit back at critics who blasted her comments and the bill she was defending. As for how she could misspeak in such a drastic way, Tran said she wasn't "agile" enough in the face of difficult questions from her fellow delegates. "I wish that I was quicker on my feet and I wish that I was able to be more agile in that moment," Tran told the Post in a telephone interview. "And I misspoke, and I really regret that." During a hearing on the bill, she told a fellow lawmaker that her bill would allow babies to be aborted on the day of their delivery, something she is now saying is "infanticide." It was Virginia's Majority Leader Todd Gilbert (R.) who asked about the day of the birth. "Where it's obvious that a woman is about to give birth, she has physical signs that she's about to give birth, would that still be a point at which she could request an abortion if she was so certified?" Gilbert asked Tuesday. "She's dilating." At the time Tran said her bill would allow an abortion in that case; Thursday she backtracked about what she should have said. "I should have said: ‘Clearly, no because infanticide is not allowed in Virginia, and what would have happened in that moment would be a live birth,’ " she told the Post. "I want to be very clear about what’s currently allowed in Virginia law," Tran said on her Twitter video. "Right now, women are allowed to access abortion in the later stages of pregnancy under certain conditions with the approval of medical doctors. I‘ve done nothing to change that. What I have done is try to make sure that women are able to make these decisions and access these services in a timely manner." Tran’s bill makes it easier to get an abortion by drastically reducing the medical requirements to perform the operation. Instead of three doctors approving the operation, the bill says a patient would only need one, and it also strikes the requirement that continuing the pregnancy would "substantially and irremediably" impair a woman’s health. Pro-choice groups have dismissed critics of the bill and late-term abortion in general by saying it is only done in circumstances where the fetus is "non-viable." However, the liberal Guttmacher Institute has data contradicting that point, showing the majority of abortions after 20 weeks are made for reasons other than the woman’s health. Tran said there’s nothing in her bill that should shock Virginia lawmakers, and she was "surprised" by questions other delegates asked about the implications of the law. "I presented the bill this week and was really surprised by the line of questioning that I got," she said in her Twitter video Thursday. "This bill had been introduced in the General Assembly in previous years, and in fact, this session, was also introduced in our State Senate." Her reasoning to back the bill is based on the personal experiences of women and a desire to end "unduly burdensome barriers" to abortion. "I know women in my family, women in my district, and women across Virginia who have had to make the very personal decision as to whether or not they’re going to have an abortion. That’s why I introduced a bill to repeal the medically unnecessary and unduly burdensome barriers that Virginia women face when they are accessing this healthcare service in consultation with their doctor," she said. Pro-choice activist groups have publicly backed Tran's efforts, including NARAL. Gov. Ralph Northam (D.) came under fire Wednesday for his attempt to defend the bill after Tran’s initial comments in the Virginia Assembly saying abortions should be legal when the mother is dilating. Northam mused about the circumstances in which babies are allowed to die after being born, prompting backlash he fought by saying his comments were taken out of context. "Republicans in Virginia and across the country are trying to play politics with women's health, and that is exactly why these decisions belong between a woman and her physician, not legislators, most of whom are men," Northam’s spokesman said. In his original comments, he said women in difficult circumstances sometimes had to have abortions, and he said "a discussion would ensue" between doctors and the mother about what to do with certain babies after they are born. "If a mother is in labor, I can tell you exactly what would happen. The infant would be delivered. The infant would be kept comfortable. The infant would be resuscitated if that’s what the mother and the family desired, and then a discussion would ensue between the physicians and the mother," Northam said Wednesday, alluding to the physician and mother discussing whether the born infant should live. Some support for the bill in Virginia is melting away, as evidenced by Del. Dawn Adams (D.) saying she no longer supports the bill now that she’s read what’s in it. Some pro-life members of Congress, such as Sens. Marco Rubio (R., Fla.) and Ben Sasse (R., Neb. ), blasted Northam when video of the interview went viral. "What’s shameful is that you’re too cowardly to say point blank that it’s wrong to leave babies to die after birth," Sasse told National Review. "You could have said that yesterday. But because you’re terrified of an extremist pro-abortion lobby that now defends even infanticide, you’re still ducking." Updated 3:02: This post has been updated to include Tran's Thursday statement to the Washington Post saying she "misspoke" on Tuesday. This entry was posted in Issues and tagged Abortion, Ben Sasse, Marco Rubio, Virginia. Bookmark the permalink.